How can you define contemporary design when it’s very definition means it changes with the times? Well, in broad terms contemporary design is anything that is the opposite of retro and traditional and is instead innovative, modern and new. In the 21st Century you can define contemporary design as bold, with clean lines and a strong emphasis on natural materials, stark black, white and bold colours, and lots of light. Contemporary kitchens are easy to spot, with their sleek, minimalist kitchen cabinets, glossy finishes and bright open spaces, while contemporary furniture around the rest of the home often plays with curved lines and innovative materials. Contemporary interior design is modern in essence, but it should not be confused with the interior design and architecture style of ‘modern’, which was a style introduced in the middle of the century and is often termed ‘midcentury modern’. 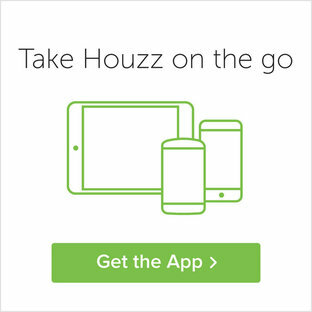 Modernism is different from contemporary design and architecture but because the word ‘modern’ has become synonymous with ‘contemporary’ in everyday talk, there is often lots of confusion between the two styles. If you’d prefer to see simple, functional design and architecture, with lots of right angles and machine-produced materials, then choose the Modern style. If you love contemporary kitchens, bedrooms, bathrooms and living rooms with gloss, glass and curves, stick with contemporary. 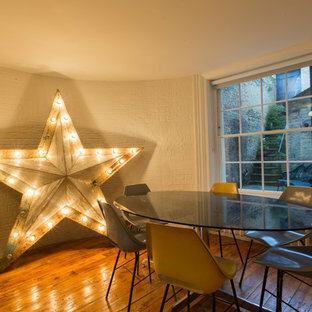 Small contemporary enclosed dining room in London with white walls and medium hardwood flooring. 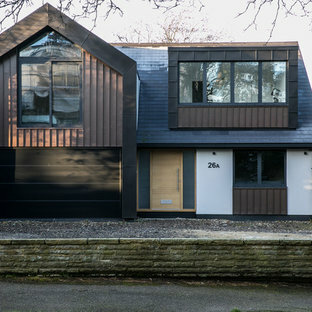 Photo of a large contemporary exterior in London with three or more floors. 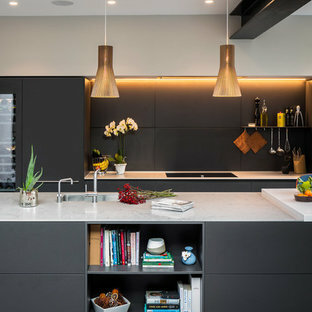 Inspiration for a contemporary galley kitchen in London with a submerged sink, flat-panel cabinets, white cabinets, white splashback, black appliances, dark hardwood flooring and an island. Medium sized contemporary two floor detached house in Surrey. By Kitchen Bee Design Ltd. 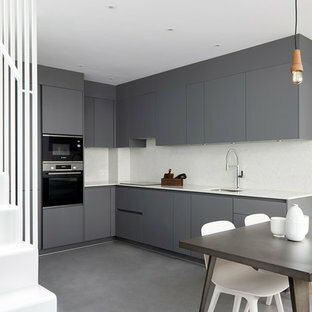 This is an example of a contemporary l-shaped kitchen/diner in London with a submerged sink, flat-panel cabinets, grey cabinets, white splashback, black appliances, no island, grey floors and white worktops. Inspiration for an expansive contemporary living room in London with a standard fireplace, a stone fireplace surround, brown floors, white walls and dark hardwood flooring. Design ideas for a small contemporary back terrace and balcony in London with a fire feature and no cover. 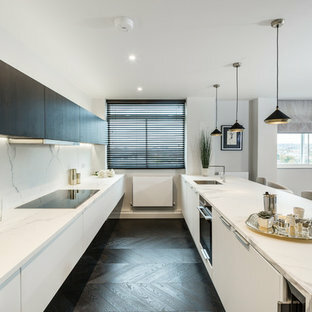 Photo of a contemporary galley kitchen in London with a submerged sink, flat-panel cabinets, black cabinets, black splashback, an island and white worktops. 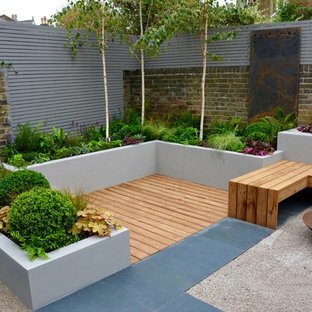 Design ideas for a contemporary back formal full sun garden in London with a garden path and gravel. By Crawford & Co. Construction Ltd.
Design ideas for a medium sized contemporary dining room in Oxfordshire with white walls and grey floors. Photo of a contemporary wood u-shaped staircase in London with wood risers. Design ideas for a contemporary bedroom in London with green walls, carpet and grey floors. 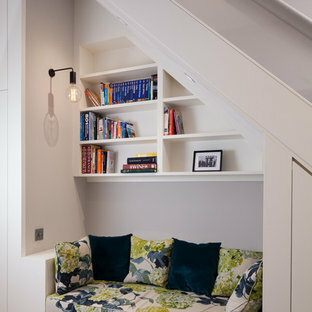 Contemporary children’s room for boys in London. Inspiration for a small contemporary single-wall kitchen/diner in Hertfordshire with a submerged sink, shaker cabinets, grey cabinets, quartz worktops, white splashback, black appliances, no island, white worktops, medium hardwood flooring and beige floors. Design ideas for a large contemporary gender neutral walk-in wardrobe in London with flat-panel cabinets, white cabinets, dark hardwood flooring and brown floors. Design ideas for a medium sized contemporary kitchen in London with flat-panel cabinets, grey cabinets, composite countertops, beige splashback, glass sheet splashback, cement flooring, an island and grey floors. This is an example of a contemporary home office and library in Hertfordshire.